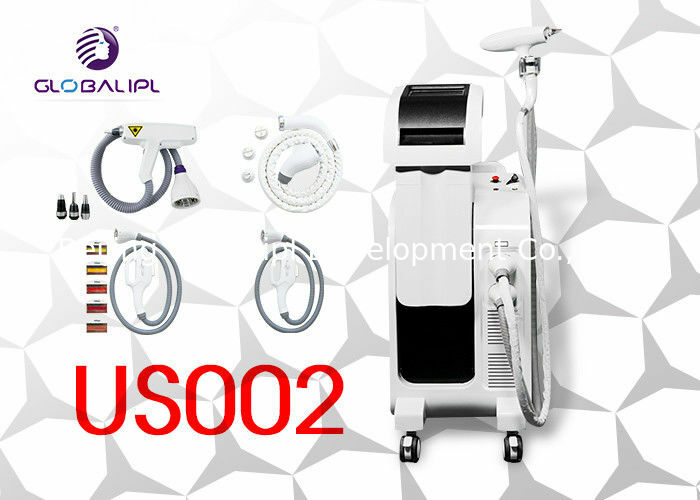 This machine combines with E light (IPL+RF system), IPL, RF and ND YAG laser system together, and four different handpieces at the same time. The handpieces are E light handpiece, IPL handpiece, bipolar RF handpiece and ND YAG laser handpiece. It can identify the relevant systems automatically when plug different handle; so we call it intelligent. 1. If you plug E light handpiece to machine, then the machine identify and turn to E light system automatically. In response, it displays the E light system menu and E light (IPL+RF) performance in turn. 2. Turn off machine, draw out E light handpiece and plug RF handpiece in turn; and then the machine can identify and turn to RF system automatically. Initial design: automatic screen lifting 25cm. a. Avoid sunlight and burn before and after the treatment, could use the suntan lotion (cream) (SPF>30) to avoid direct sunshine. d. Avoid direct or indirect heart stimulation to the treatment area after 3 days of the treatment, especially to those of high pigment deposit. e. If taking laser skin care treatment before, please wait for 3 weeks at least and then do this treatment. f. After the treatment, patients are not allowed to eat the foods of dark color or great pungent within two weeks, such as the sauce, coke, seafood, capsicum etc. i. Please cooling the bad reaction area after the treatment, like tumescence and causalgiase. j. after the operation, make sure clean the probe. k. it's not allowed to operate the machine without professional operators. 1. It focus on high-tech beauty and medical machines for 16 years. 2. It has professional and excellent engineers and designer for your OEM & ODM orders. 3. It can provides ODM service, adding logos on the screen for free. 4. It regularly cooperates with large research institutes every year. 5. Machines are the best in China and company's policy is always quality first. 6. Choose the best suppliers to ensure the quality of products from the source. 7. It applicates the principles of ISO quality management system in factory's construction. 8. It adopts the inspection of product quality standards, if there is a problem back assembly and commissioning in time. 9. It has a professional 24-hour online after-sales team, which can solve any problems for you in a timely and effective manner. 10. It adopts strong and beautiful aluminum alloy case to ensure that on damages in shipping way.